Offer Details: Groups of 12 or more are required to call in advance. We’re one of the oldest wineries in the state and the original winery of the Eugene area, and this history and experience shines through in the quality of our wines. We also source fruit from a variety of vineyards in 3 different appellations throughout Oregon so we’re able to offer a wide variety of wines. 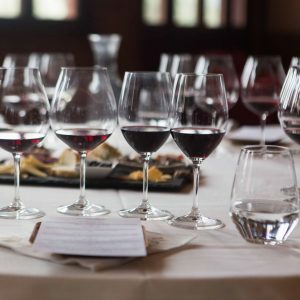 We are best known locally for our vast selection of robust, full-bodied reds such as Malbec and Cabernet Sauvignon, that are made with fruit from southern Oregon’s Rogue Valley. Eugene’s first winery opened as “Hinman Vineyards” in the 70s, becoming one of approximately 35 operational wineries statewide. Its stellar wines propelled the novice winery to the forefront of Oregon’s burgeoning wine industry, securing its place among Oregon’s top producers by the 80s. Today, the winery has been renamed “Silvan Ridge” and is owned by Elizabeth Chambers. Led by their exquisite Willamette Valley Pinot Noir and Pinot Gris, a delightfully effervescent early Muscat, and other micro-production varietal wines from the Rogue Valley region, Silvan Ridge presents a portfolio of elegant, distinctive and stylish wines. Crowned by an iconic clock tower and overlooking its own grassy amphitheater, Silvan Ridge Winery is a prime gathering place for social entertainment, families and fitness-minded enthusiasts who run or ride the scenic back country roads. Relax on the pet-friendly patio or cozy up around the indoor fireplace. Each year Silvan Ridge Winery hosts summer concerts, special events and the Annual Twilight 5K.